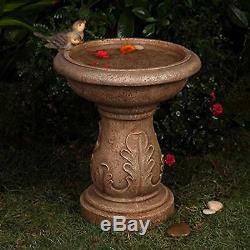 Create a lovely little Shangri-La for your feathered friends with his beautiful birdbath fountain. This beautifully sculpted polyresin and fiberglass fountain comes in a classical pedestal shape with wide basin and faux stone finish that will look delightful in your garden or front lawn. To entice even more birds to land and enjoy the pool, this bath also features a pair of lifelike birds perched along the rim where they admire their own reflection in the clear water. Dimensions: 14.6W x 13D x 18.1H in. Made from polyresin and fiberglass. Classically styled birdbath with faux stone finish. At Uneedum, we truly believe we have some of the coolest products in the world, and we want to make sure we back that up with a risk-free ironclad 45-day guarantee. If you don't like it, no hard feelings we'll make it right. The item "Classical Garden Birdbath Fountain Two Birds Faux Stone Pedastal Basin" is in sale since Wednesday, January 30, 2019. This item is in the category "Home & Garden\Yard, Garden & Outdoor Living\Bird & Wildlife Accessories\Birdbaths". The seller is "uneedumstore" and is located in Springfield, Virginia. This item can be shipped to United States, Canada, United Kingdom, Denmark, Romania, Slovakia, Bulgaria, Czech republic, Finland, Hungary, Latvia, Lithuania, Malta, Estonia, Australia, Greece, Portugal, Cyprus, Slovenia, Japan, China, Sweden, South Korea, Indonesia, Taiwan, South africa, Thailand, Belgium, France, Hong Kong, Ireland, Netherlands, Poland, Spain, Italy, Germany, Austria, Bahamas, Israel, Mexico, New Zealand, Philippines, Singapore, Switzerland, Norway, Saudi arabia, Ukraine, United arab emirates, Qatar, Kuwait, Bahrain, Croatia, Malaysia, Brazil, Chile, Colombia, Costa rica, Dominican republic, Panama, Trinidad and tobago, Guatemala, El salvador, Honduras, Jamaica, Antigua and barbuda, Aruba, Belize, Dominica, Grenada, Saint kitts and nevis, Saint lucia, Montserrat, Turks and caicos islands, Barbados, Bangladesh, Bermuda, Brunei darussalam, Bolivia, Ecuador, Egypt, French guiana, Guernsey, Gibraltar, Guadeloupe, Iceland, Jersey, Jordan, Cambodia, Cayman islands, Liechtenstein, Sri lanka, Luxembourg, Monaco, Macao, Martinique, Maldives, Nicaragua, Oman, Peru, Pakistan, Paraguay, Reunion, Viet nam.